So I decided to bake this morning, though turning on the oven in this heat probably wasn't the best idea I've ever had! I googled "applesauce" muffins and came up with a few hits. I picked one and modified it a bit as I didn't like the amount of salt the recipe called for and I increased the cinnamon. 1 tsp cinnamon (original recipe called for 1/2 tsp). In a medium bowl, combine applesauce, sugar, egg and butter together. Place to the side. In a small bowl, combine dry ingredients and mix together. Fold dry ingredients into wet ingredients until well mixed. Fill muffin cups 1/2 way and bake at 350∘ for 25 min, or until cooked through. Tuesday night was the last meeting for my Guide unit this year. I'm sad we're done; but, I'm ready for a break. That doesn't mean I won't still be Guiding though. I'm also the Community 12 Guider of PR so right now I'm working on getting material out to the schools to go home with girls before summer vacation; and then I'll be getting another batch out in September. So there's lots to keep me busy. 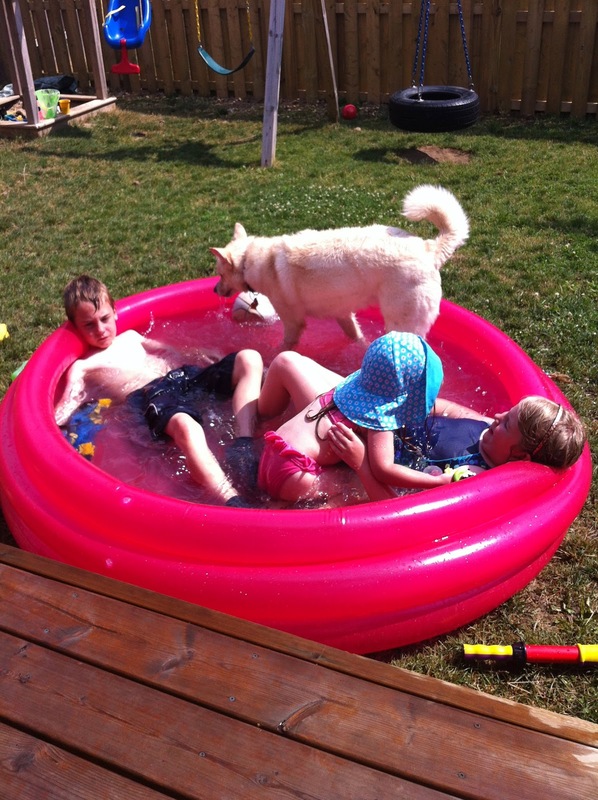 We had a fabulous month including two camps to wrap up the year. The first camp was our annual Heritage co-op camp with the local Scouting groups. We're very fortunate in our area that the Guiding and Scouting movements join together to do a lot of fun things. We arrived Friday night and immediately set about pitching tents. This was somewhat of a challenge as the girls are still rather new to camping and didn't know how to proceed; and, it was the first time using some of the tents, only to find broken polls or a missing rain fly. It was definitely a lesson in how to "Be Prepared"! Somehow, we managed to get the tents up before dark and settle in for mug-up before bed. Just as we were heading to bed though, it started to drizzle. It wasn't horrible; but, it was enough to make everything damp. Another valuable lesson for the girls; keep your beds rolled up, so the damp doesn't settle in it before you're ready to use it. We woke Saturday to rain, rain and more rain. Thankfully, it wasn't a downpour, just a steady light rain. The temperatures were warm, making the day bearable. After a delicious breakfast of pancakes and sausage it was time to start the activities. We waited a while to see if the rain would stop and "Akela" from the Cub group led the kids in a round of Singing in the Rain, a rather fitting song given our circumstances! 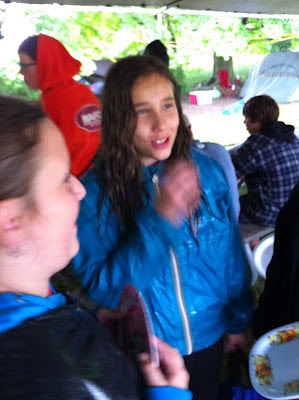 Sadly, I didn't take many pictures at camp as the rain just wouldn't let up. Our theme for the weekend was CSI and our round-robin activities included stations for crime scene reconstruction, figure out the crime that took place, finger printing, search & rescue, "mad scientist" craft, and more. The kids all seemed to have a great time despite the rain. I even managed to capture a few smiles from the girls while they waited patiently for their lunch. Finally, on Saturday as our activities wound down, the sun came out and the Scouts brought out the water balloon sling shot. The kids were so excited to try and "catch" the balloons. It was quite humorous to watch! The weather remained beautiful for the rest of the weekend. I suffered only a few (over 60) mosquito bites and despite a sick girl going home at 3am Saturday morning, I wasn't any worse for wear. 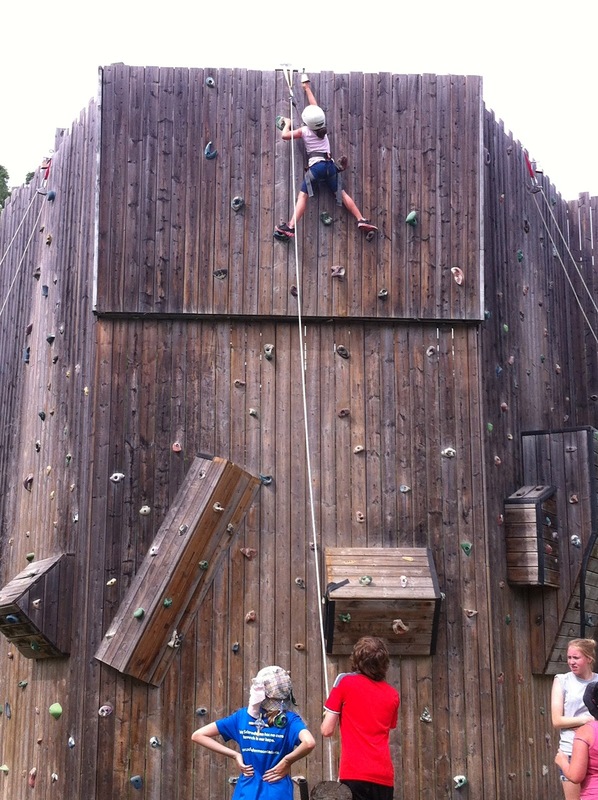 This past weekend, we took the girls to our Community Camp at Circle Square Ranch. We had awesome weather, though it could have been a little cooler! The girls have told us that this was, by far, their most favourite camp of the year. I think it may have something to do with the horses! We did archery, which let me say, is AWESOME! 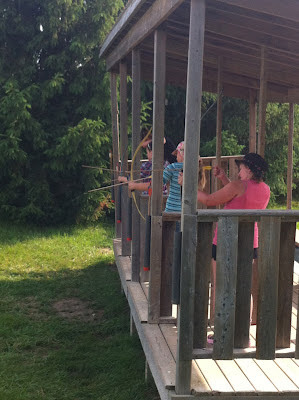 Sunflower and I had so much fun learning to shoot the bow & arrow. I think we may need to have an archery camp next year! After archery, our activity was riding. I'm glad we got to ride in the morning as it was REALLY hot after lunch. For some of the girls, riding a horse was a huge accomplishment. 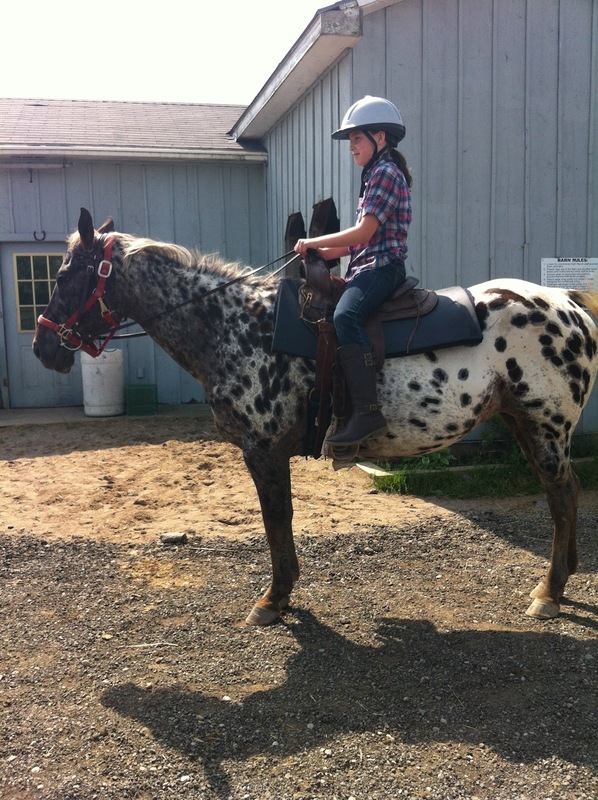 Some had never been on a horse before, others had had bad experiences in the past with horses. 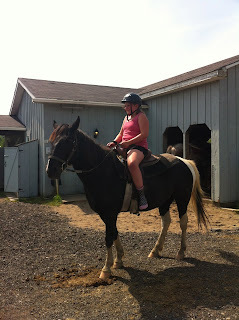 But all our girls got "back on the horse" so to speak and had a great time. The horses were all very gentle and sweet. These two beautiful horses are Davinci and Patty. Patty made me laugh as she always had her tongue out. I thought it was her way of keeping cool until I learned she didn't have any teeth and couldn't keep her tongue in; poor baby. After our ride it was time for lunch. Delicious hamburgers, hot dogs with all the fixins' filled us up for the afternoon. We started after lunch with outdoor education and the girls learned how to properly build a fire! 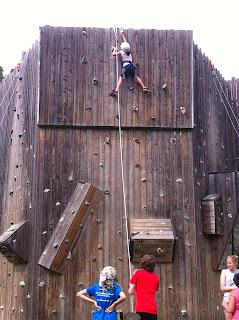 Next we moved to crafts where we made lots of awesome camp hat bobbles and finally we moved to...the climbing wall! 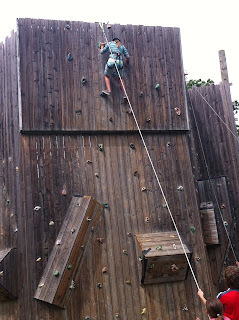 The girls actually found it more challenging than they had originally thought. Out of the thirteen girls, only two made it to the top! We wrapped up the day with a wonderful campfire and the girls were all asleep by 10pm! A rarity at any camp. All in all, I think Circle Square Ranch was a perfect way to end the year. The girls, and leaders, all had a wonderful time and are already asking to go again next year! 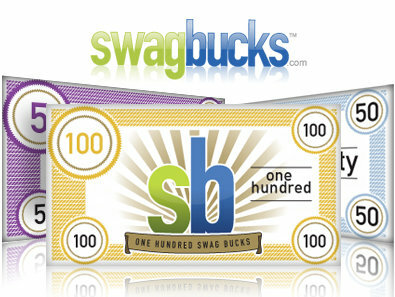 Swagbucks has a great way to earn Swag Bucks! On June 20th they're having a Swag Code Extravanga, which is an opportunity to get Swag Bucks for nothing. They're giving away 60 Swag Bucks in codes throughout the day, so get there early and stay throughout the day for more chances to win! Don't know what Swagbucks is all about, well what if I told you, you can earn points for doing things we do every day, like searching the internet? Those points, Swag Bucks, can then be translated into great stuff like gift cards, electronics and more. I can't believe it's been so long since I last wrote. I apologize to my readers for the lack of updates. 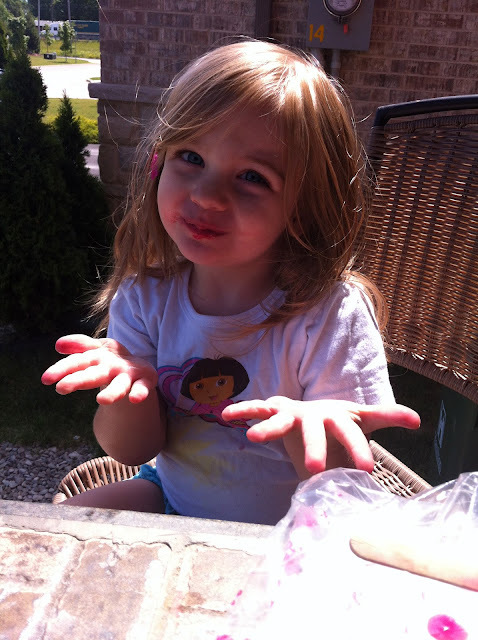 May and June get to be crazy around here with school winding down, Scouting and Guiding finishing up and more. Last Wednesday, our Guiding Community held a recognition ceremony for girls and Guiders that have earned awards and completed program. I was invited to attend, not only as a member of the Community; but as I had nominated a peer for an award. Unfortunately, she couldn't attend the ceremony; but, I was happy to attend to show my support for those that could be there. As it turns out, I also received two awards that night. The first was an Ontario Volunteer Long Service Award. I had no idea these awards even existed, so I was quite surprised to have earned my 10-year pin and receive a certificate signed by the Premiere himself. I also received a beautiful pin to commemorate the Queen's Diamond Jubilee as part of my award. The second award is much more meaningful as my peers nominated me and submitted beautiful letters in support. I found it very difficult not to cry as the presenter read one of the letters aloud. I am eternally grateful to Sharon and Tammi for taking the time to recognize my efforts even if it is a job I love doing. The award given is the Gold Unit Guider award. The years of experience are cumulative and a Unit Guider may receive any or all of the Awards during her tenure in Guiding.